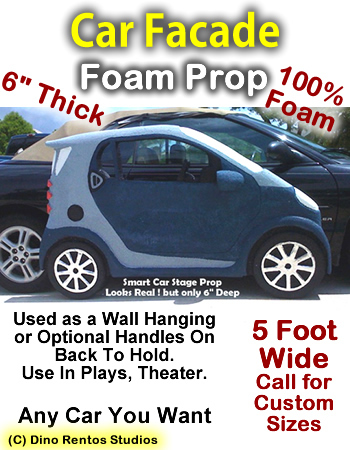 Car Facade Foam Prop Display - Dino Rentos Studios, INC.
5 foot wide by 6 inches thick. Flat in the back to hang on wall. Select Painted Foam or Hard Coated for long-term use durability. Add optional handles to carry in front of you on stage. Volume pricing available. Call us for details. Savings on multiple units and shipping.